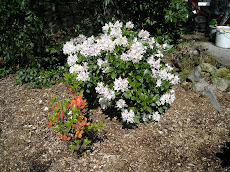 Well it's a few days since I got back from holiday and although all the snow an d ice has gone thank goodness, the ground is frozen solid which is a bit of a pain as I had planned to get stuck into doing a bit of late digging and finish erecting my new greenhouse, I knew I should have done it in late summer early October when the weather was good but as I had to build it on the site of my old smaller one it seemed a shame to take that down when the tomatoes were fruiting away furiously and now I'm stuck trying to do it at weekends as the days are too short for working in the evenings and as you can see it looks a bit like a building site at the moment. 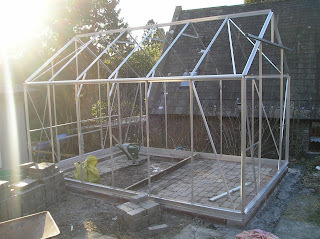 It is going to have a solid floor made with spare bricks that I have had left over from other projects and others recycled from the previous greenhouse, as I prefer to do all the growing in pots. All of the pots that I used in the past have come from the farm that were sold to us full of animal feed but just recently Health and Safety has meant that we can only get every thing in smaller lightweight buckets so we don't hurt ourselves lifting them, OK for us I suppose but they are a bit useless for growing in so I have had a look on the net for some large pots and the cheapest I found were about £6 pound each. My shallots are now potted up, a bit later than last year but as it has been so cold I don't think they will be very far behind come planting out in the spring and I got my NVS Sherine and Amour potatoes this week from Jamieson's of Annan they look clean and healthy and should be interesting to grow this Summer, also I picked up from our local garden centre some Kesterel but they have decided not to stock Winston this year for some reason so I will have to try some where else for them this week, I gave the Kesterel a good wash under the cold tap as shown in Sherie Plumbs DVD to sort them out and I must say I was I bit disappointed with them when I looked at them closely they had a fair bit of scab marking on them, they say it doesn't affect the new crop but I'm not so sure as last year I had a lot of scab on my Winstons especially and they were grown in clean fresh peat not in garden soil. An old trick I was told to kill off the scab bacteria used to be dipping the seed potatoes in a weak solution of formaldehyde for a hour It sounds a bit drastic but I wonder if that would work or even if it's still legal! does anyone know? There's no getting away from this cold weather and work outside in the plot has ground to a halt, the only good thing with all the snow covering everything my garden looks as good as everyone else's, though I have taken the time today to pot on my leeks that I started mid November on into some 5" pots, should have probably done them sooner but there you go, and now they look a bit lost in such large pots. I would have usually put them into 3" pots first then 5" but as I am off to Portugal in just over a week for a break and will have to leave them to fend for themselves I thought they would have less risk of drying out whilst I am away in a bit more compost. 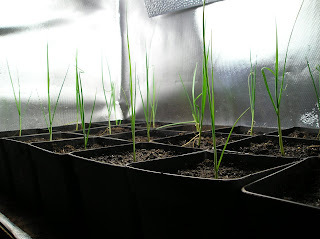 The leeks are now about 6"/8" in height which is probably on the small size compared to some but I have tried to grow them at a slightly cooler temperature this year so as to be able to keep them moving froward slowly but steadily so as not get too tall and leggy too soon when it is still Winter. On the farm we have had a bit of a problem with the cattle's water troughs freezing up and this morning I arrived to find a leak in the system which had made quite a mess, plumbing is not one of my favourite jobs but we finally managed to get it sorted and mopped up but it was a cold and miserable hour doing it. I think it was a serious ask, hell he must be desperate. This is the third week now, since it went cold and snowy and it is not showing much sign of changing yet, all the side roads and pavements are still covered in solid ice about a couple of inches thick, making it hard to get about and I am still having to walk to work because the local council will only salt the main roads, hard to believe that at the end of November, Cumbria had the wettest 24 hours ever recorded in England at just over 12" rain when Cockermouth got flooded and Workington had it's bridges washed away, I don't think we have ever had so many Government ministers and national politicians rushing up to see how things were, making sure that they got their faces on TV, you would think there must be an election coming soon. Thinking of visitors I have just been watching ITV's new series "The Lakes" recorded last Summer, if you were eagle eyed you might just have spotted my house from the ariel shot of Windermere thankfully the garden looked tidy and all veg seemed OK. Another victim of this weather is the work on my new greenhouse that has ground to a halt as it is just too cold to start handling the glass but hopefully it will be finished soon and I can get my shallots planted. On Saturday I got to Goodison Park to see United play Everton, even though we lost and the score was 3-1 it was a great game with United playing some of the best football and up until the 83rd minute we could have nicked it having had a great shot from Danny Livesey strike the underside of the bar 5 minutes before Everton scored their second goal after getting away with a dodgy foul in the build up to it, their last goal was a penalty when they caught us on the break in the last thirty seconds as we had one last attack and only left the goalkeeper back, but at least his was a good fair foul. Now as they say we can concentrate on the League although we are still in the Johnson Paint Cup with a tough semifinal draw against Leeds United but they are now't so we should see them off.